In the wake of the demonstration of 8 April 2014 in Sichuan’s Dege county, another Tibetan was arrested by the police. A young Tibetan was taken into custody Tuesday [9 April 2014] by police in western China’s Sichuan province after he walked alone along a public road, scattering paper flyers and shouting slogans challenging Beijing’s rule in Tibetan areas, sources said. 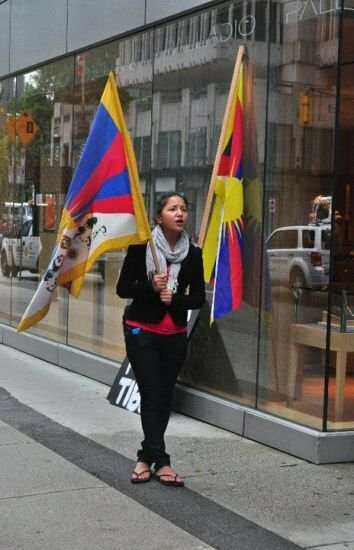 The April 8  protest in Manikengo town in Sichuan’s Dege county prompted cries of support from Tibetan onlookers, who echoed the young man’s calls for the long life of exiled spiritual leader the Dalai Lama, a Tibetan living in exile told RFA’s Tibetan Service on Wednesday [10 April 2014]. “Tibetans standing on the sides of the street repeated the slogan and raised shouts of 'Ki Hi,' expressing support for his actions,” the source said, speaking on condition of anonymity and citing contacts in the region. “Later, police arrived at the scene and detained him,” he said. A second exile source confirmed the protest, citing contacts in his native Dege county. “It is true that the protest took place, and the youth is said to have come from Kyegudo [Yushu] county,” in neighboring Qinghai province, the source said. Separately, a local shopkeeper also confirmed the youth’s lone protest, placing it at about 12:00 p.m. local time. “A Tibetan walked down the street here in Manikengo and protested. He was later detained by police,” she said. A total of 130 Tibetans have also set themselves ablaze in self-immolation protests calling for Tibetan freedom, with another six setting fire to themselves in India and Nepal.